I have to be short and sweet today. Baby C had his four month shots yesterday and he is F-U-S-S-Y! He’s in the bouncy seat next to me right now, only content if my foot bounces the bejeezus out of the seat. These are a super and easy treat to make with the kids. Mine loved making their very own gold coins to place at the end of their paper rainbows. Warning: they are ridiculously addictive little boogers (the cookies, that is). 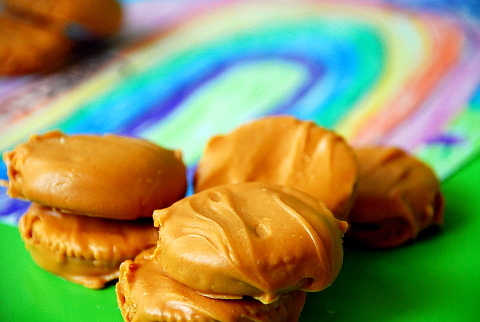 Something about the buttery Ritz, salty peanut butter and sweet butterscotch is an irresistible combination! Open all the packages and get your Ritz ready. Place the chips into a glass bowl, melt in microwave on 70 percent power for one minute. Stir. Continue melting in 20-second intervals until smooth, stirring after each. Drop the Ritz in, coat with butterscotch, and shake off the excess. (I used one hand for dipping and the other for brushing off excess coating.) 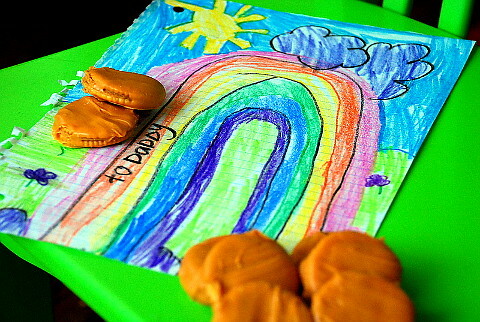 Place cookies on waxed paper or a silpat to set up. Try to eat only one...I dare you!